He peers out of the stucco house, loose-lipped and sunken-eyed. The man is rangy with tightly drawn, rusty skin and a fine shock of white hair. He passes a single slender Newport to the woman at his door, who lights it, flicking off the burning tip and releasing a puff of grey. It is a Sunday, one of the year’s first, and Jane, who briefly attended school in the Palo Alto Unified School District, is showing me around East Palo Alto’s arms trade. Her name, like others in this story, has been changed to preserve her anonymity. Cars blur past like bullets on the highway, each leaving in its wake only a trail of exhaust and a string of drivers pursuing it northward on 101. “Down the block,” the man says. “‘S for a good price, too. Got a clip and everything. You gonna buy?” The man is old enough to be her grandfather, selling single cigarettes out of his front door. His accent, like his manner, belongs in the American South, and he eyes me like an unwelcome tourist in East Palo Alto, so clearly out of place and touch. Jane tells him she isn’t, that she was just curious. She exchanges a crumpled bill for a cigarette, and lights it. Jane does not hesitate to recount the story of the night several years before when she was shot, an accidental casualty o one of EPA’s violent territorial conflicts. We cross in front of Home Depot, where a group of day laborers are congregated near a red Ford whistling over faintly musical radio static. Jane recalls the sound of the shot hammering all other noise out of her consciousness, breaking against the inside of her ears. She dropped to the floor, but before reaching it she was hit in the knee, lying on her stomach in front of the neon signs of a fast food restaurant. Shotspotter, an online service that monitors the number of shots fired in a locale during a given time, reported an average of 13.3 gunshots daily in Nov. of 2012 and 108 single gunshot incidents and 178 multiple gunshot incidents in EPA in Jan. of the same year. In the same period, not a single shot was fire within Palo Alto city limits, although several reports of gun related crime have been filed with Palo Alto police, among them the arrest of two Paly students on Feb. 8 and 11 for bringing guns onto campus and several armed robberies in the downtown area. In Palo Alto, as in the rest of the country, the debate on gun control rose to prominence on Dec. 14, 2012, when Adam Lanza killed 20 children and six adult faculty members of Sandy Hook Elementary in Newtown, Conn. The shooting brought gun control to the center of political debate on the national level, drawing a proposal from the White House calling for “increased background checks for all gun sales, including those by private sellers currently exempt.” Also in the proposition was a reinstatement of the 1994 ban on assault weapons that was abandoned in 2004, and other clauses that have drawn serious reactions from proponents of relaxed firearm control and the National Rifle Association. An anti-gun group based in the Silicon Valley organized in support of Obama’s proposal at its inaugural meeting on Jan. 17. The group, which includes Palo Alto residents, plans to lobby to politicians to back Obama’s proposal. Local action in support of gun control is planned for Feb. 23 by Silicon Valley investor Robert Lee and outreach coordinator James Cook. Backed by some $50,000 in funding, an anonymous gun buyback will be hosted at Palo Alto City Hall for the tri-city area including Menlo Park, Palo Alto and East Palo Alto. The signs belong to Palo Alto Liberty, a local self-described “physical manifestation” of the anarchist group Anonymous that has taken a stance against gun control. The group claims to be “fighting tyranny and corruption when and where [it] can,” and the pending gun control proposal represents a clear breach of what it considers to be an essential constitutional freedom. John J. Donahue III, a professor of law at Stanford University and the author of “Shooting Down the ‘More Guns, Less Crime’ Hypothesis,” argues that the relationship between gun ownership and crime is not, as argued by the NRA and much of the right wing, inversely correlated. In EPA, gun ownership takes on a completely new shape. According to Jane, firearms in EPA are being used primarily for violent crime, an attitude that influences the mentality around firearms enterprise and culture in the city. “We keep our beds under the window, just in case anything flies through,” Kelly, Jane’s friend, adds, warning me, as I turn to use the restroom in a nearby building, not to cross to the other side of the street alone. The firearms that spray bullets through Jane’s and Kelly’s waking nights are sold on the street, Jane says. Donahue attributes the abundance of illegal weapons and frequency of gun violence in EPA to the propagation of drugs. By Donahue’s estimation, the drug trade and a host of other factors brought on by the socioeconomic divide between Palo Alto and East Palo Alto determine a split in the role of firearms in the two cities. 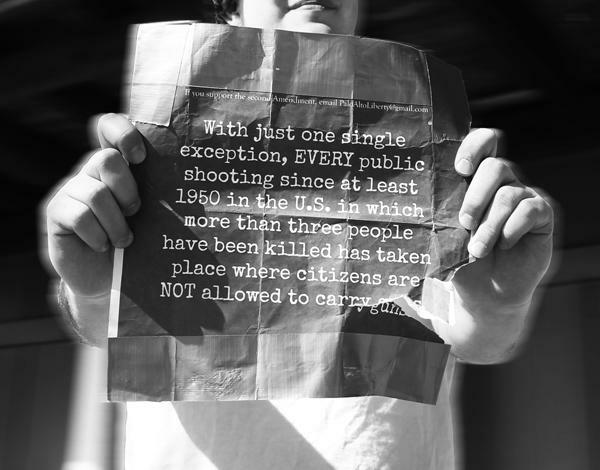 Lee Hughes, a Paly Junior and gun owner, has an attitude towards gun ownership that corroborates Donahue’s assumption. To Kelly and Jane, the restriction of gun ownership surpasses the realm of individual liberty and crosses into that of individual safety. They are not concerned with the party politics surrounding gun control, and do not stop to think about the intangible implications of tighter restrictions or of laxer ones. “If I’m not going to be waking up to gunshots, though, it means that somebody’s getting them off the streets,” Kelly says. Jane is concerned for the quality of life and the degree of safety for herself and those around her, concerned that she’ll hit the pavement again with a bullet in her knee, afraid to get help.